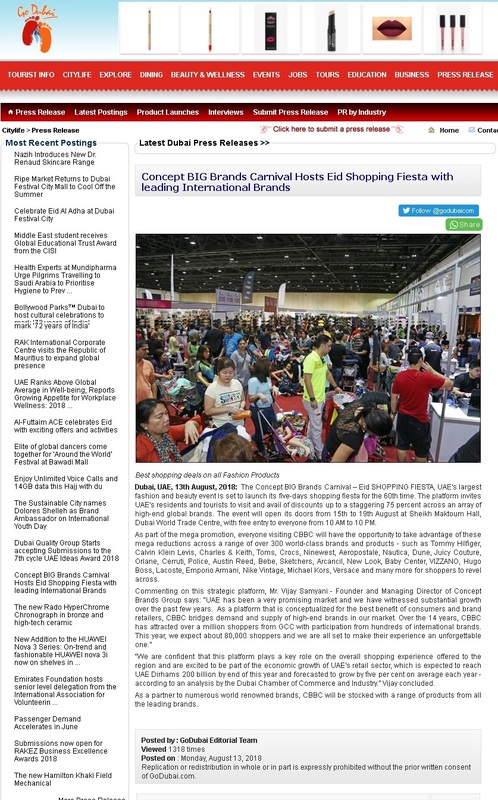 Dubai, UAE, 13th August, 2018: The Concept BIG Brands Carnival – Eid SHOPPING FIESTA, UAE’s largest fashion and beauty event is set to launch its five-days shopping fiesta for the 60th time. The platform invites UAE’s residents and tourists to visit and avail of discounts up to a staggering 75 percent across an array of high-end global brands. The event will open its doors from 15th to 19th August at Sheikh Maktoum Hall, Dubai World Trade Centre, with free entry to everyone from 10 AM to 10 PM. As part of the mega promotion, everyone visiting CBBC will have the opportunity to take advantage of these mega reductions across a range of over 300 world-class brands and products – such as Tommy Hilfiger, Calvin Klein Levis, Charles & Keith, Toms, Crocs, Ninewest, Aeropostale, Nautica, Dune, Juicy Couture, Orlane, Cerruti, Police, Austin Reed, Bebe, Sketchers, Arcancil, New Look, Baby Center, VIZZANO, Hugo Boss, Lacoste, Emporio Armani, Nike Vintage, Michael Kors, Versace and many more for shoppers to revel across. “We are confident that this platform plays a key role on the overall shopping experience offered to the region and are excited to be part of the economic growth of UAE’s retail sector, which is expected to reach UAE Dirhams 200 billion by end of this year and forecasted to grow by five per cent on average each year – according to an analysis by the Dubai Chamber of Commerce and Industry.” Vijay concluded.